Orders and decoration - all in a single application. FDM4 takes the Order Entry process one step further than the majority of ERP applications by offering an integrated Decoration Module that will allow for the entry and maintenance of Decoration Orders for your Customer base. The Decoration entry process mixes the flexibility of the Style-based Order Entry procedure and adds the ability to outline the Decoration specifications for Embellishment to the product in a single entry screen. Streamlines the Decoration Entry process by combining the ability to add the blank goods as well as the Decoration Method to the same Order for easier entry and maintenance. 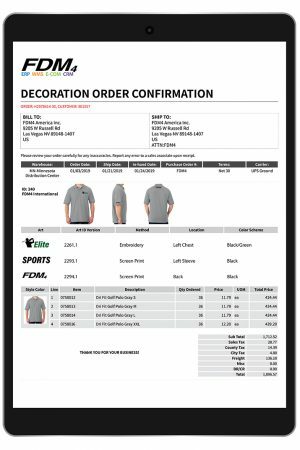 Ability to add more detailed decoration instructions, pricing and costs to customer orders. An unlimited number of decoration methods can be added to the same order to be used in the decoration process. Ability to store an unlimited number of color standards and color codes that can be used during the decoration entry process. Decoration vendor management provides the ability to specify the decoration methods that can be completed by a Vendor to assist with vendor selection. An Order can be sent to multiple decoration vendors or internal decoration workstations to complete all of the embellishments required by the customer. Pricing and costs can be defined using multiple criteria, including setup costs, decoration runs, minimum decoration quantity charges, and stitch counts. Automatic updates to the work status occur as the decoration order moves through the entry, approval, and decoration processes. 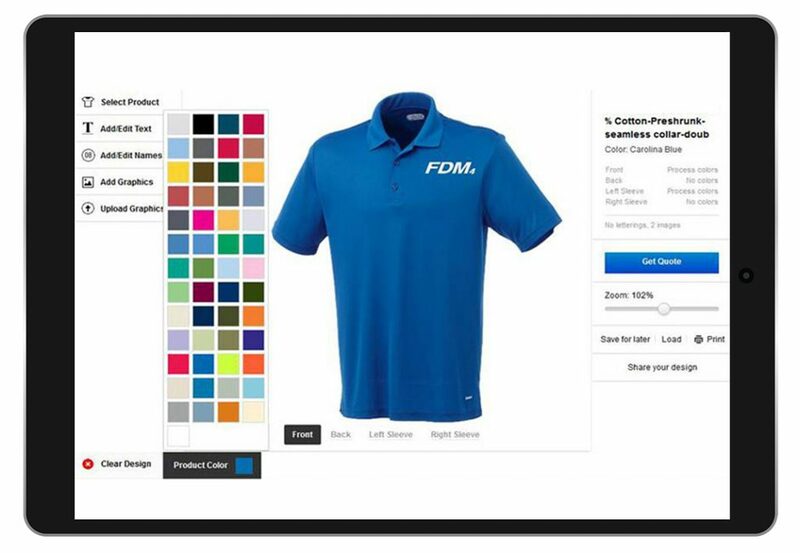 Decoration orders can be tracked using the optional integrated FDM4 B2B online order status inquiry as the status is updated in real-time while the order flows through its life cycle. Separate management procedures for art work, decoration proofs, and work orders provide management tools for decoration orders as they pass through the various departments. Art records can be added on the fly in a decoration order for a customer after which they are stored on the customer’s file for easy reorder capabilities. New art records can be added to the customer’s account independent of the decoration entry process for future use where required. Available approval process for art records which includes the ability to make changes and “version” the art records for a customer to keep track of revisions. The main image attached to an art record will display in the decoration entry process for easy viewing that the correct art is being used on the order. Proof management processes available including the ability to e-mail a proof approval form from the decoration management procedures. Decoration specific hold codes are automatically applied to the decoration order and are used to manage the overall work flow of the decoration order. 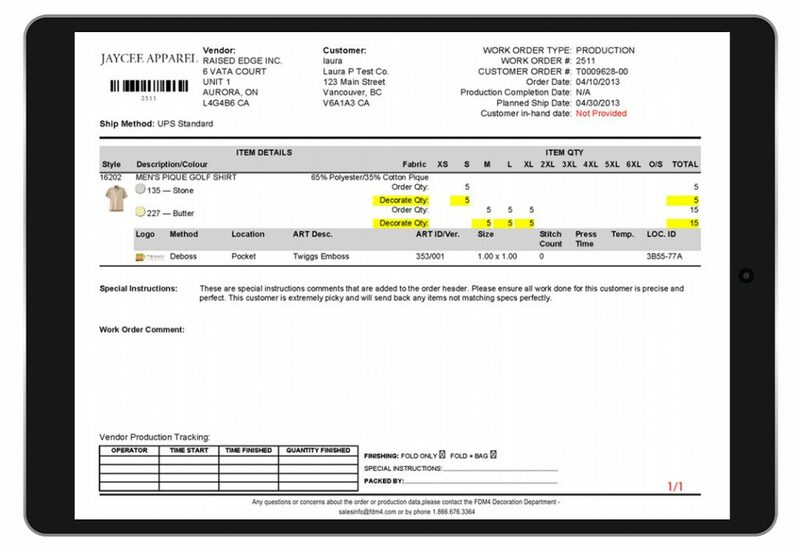 Attachments and comments can be added to any work order before it is sent to the appropriate vendor or internal work station with any additional information required to complete the decoration. The Decoration Module is designed to handle Decoration production that is completed either in-house, or sent out to a third party. Complete tracking and Work Order management procedures are available to streamline the process. Streamlining the Decoration Entry and Maintenance procedures will allow you to spend less time managing the transactions and more time generating additional revenue with the ability to handle more Orders quickly and efficiently. Art Records and Proof Approvals can be managed from within the application without the need to reference outside sources. Changes to the Art Requirements can be stored as different versions allowing for quick references to changes and the ability to revert to a previous version quickly. The maintenance procedure will allow Digitizing files to be stored with the Decoration Order for a single point of reference and easy communication with the Decorator on the work to be completed.